Designed by master craftsman Justin Nevins, a Cryptex® brand security box is a self-contained cylindrical lockbox secured by a mechanically-changeable code. Used in escape rooms or collected by fans, a Cryptex is a beautiful, functional, solidly-constructed work of art. No, it is absolutely FREE with no “in app purchases” or anything. We wanted to encourage as many people to play this hunt as possible and hopefully have a good time doing it! All time, efforts and costs have been donated in order to keep it free for the general public. How is the Cryptex Hunt structured? The Cryptex Hunt will start on Feb 24, 2018, which is a Saturday. When you play, you will find a number of qualifying puzzles to solve throughout the weekend. Once you complete the qualifying puzzles, you will be able to play the five main puzzles, each released daily starting on Monday, Feb 27, 2018 at 8:00pm EST. Once you solve the fifth puzzle given on Friday, Mar 2, 2018, you will have access to the first Finale Puzzle when they are released on Saturday, March 3, at noon EST. 03/20 NOTE: due to issues that occurred on March 3, the finale was rescheduled for March 10 and is now completed. The first person to complete the Finale Puzzle will be declared the winner and is eligible for the grand prize. Everyone else who completes the Cryptex Hunt by April 7 will be eligible for the 2nd Prize draw. Registration opens on Feb 24, 2018, the same day Cryptex Hunt opens. 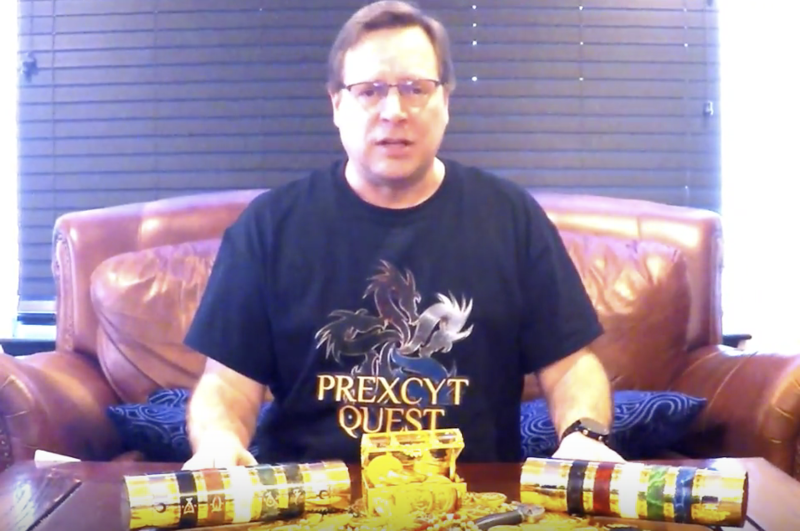 Prexcyt is part of the theme of the Cryptex Hunt. More will be revealed during play. What kind of puzzles will be included? Can I use the Internet to solve the puzzles? These puzzles are designed for this event — you won’t be able to Google the solutions. However, you are welcome to use Google or other tools to help you as you work on them. In fact, you more than likely will need Google to help you solve puzzles. Many Internet tools exist that may be useful for working puzzles. Grand Prize – The first qualifying person to complete the Prexcyt Quest will win a custom handmade Nevins Line Cryptex® Security Box hand crafted by Justin Nevins made from real stone and brass with 23k gold inlay (estimated value $3500). This box has been specifically designed for this Puzzle Hunt and will be theme appropriate. Second Prize – This will be determined by a random draw of all other participants who complete the Prexcyt Quest by April 7, 2018 at 11:59 PM. They winner of the draw will win a standard line Cryptex® Security Box replica of the Grand Prize. This box will be made with poly-carbonate and brass instead of real stone (estimated value $650). Obviously, the Grand Prize winner is not eligible for this prize. Daily Prize Winners – There are prizes for the first person to solve each of the daily puzzle challenges without hints; however, each person can only win one of the daily prizes. Every person who wishes to play will register and play the puzzle hunt as an individual. However, you are certainly welcome to play together, share answers, and operate as a team. In fact, we would encourage small groups to play together since the puzzles will require multiple skills. Please note, however, the Grand Prize and 2nd Prize will be awarded to the owner of the qualifying winning user account. How will the puzzles be delivered? During the course of the Cryptex Hunt, puzzles will be delivered through an interface which will be revealed when you play the puzzle hunt. Players will need to explore and discover them. What if I get stuck? Can I ask for help? When a puzzle is first released, there will be no hints available for an initial waiting period to give players the time to explore and experiment. Hints will be made available after that waiting period and after at least one person has solved the puzzle. However, if no one has successfully solved the puzzle within a given time limit, hints will be made available. Additional hints may be made available later if players are still struggling. For the Daily Puzzles and the Finale, no hints will be given until the day’s prize has been won. Do I have to play at a certain time? Not necessarily. Only the timing of the Finale events are important if you want a chance to win the Grand Prize. The Warmup puzzles start on Saturday 02/24 at noon EST. During this weekend, there are several puzzles to play through which will help players gain familiarity with the puzzle structure. Apart from leaderboard recognition, there are no prizes for these puzzles, so you can play them at any time, even if you can’t play on the 24th. You have to complete all the Warmup puzzles to proceed to the Daily puzzles. The Daily puzzles are released one a day, Monday through Friday, at 8 PM EST. In addition to leaderboard position, the first person to complete each daily puzzle will receive a small prize. Players can only win one daily prize, so on subsequent days, the daily prize is awarded to the first player to complete that day’s puzzle who hasn’t already won a previous day. You have to complete each Daily puzzle to continue to the next or the Finale. Even if you previously have been playing casually, you can still attempt to get caught up by the start of the Finale if you want a shot at the Grand Prize. The Finale puzzles are released on Saturday 3/3 at noon EST. This is a race to the finish for the Grand Prize! The first qualifying player to complete all the Finale puzzles will win the Grand Prize. The game will continue to be available to April 7, 2018 at 11:59 PM. All qualifying players who complete all the puzzles by then will be eligible for a chance at the Draw Prize. So, even if you start late, you still have a chance at an awesome prize! That depends. The fastest time it took some to solve the Warmup puzzles with no hints was around 2 hours. However, the average time it has taken people is 14 hours. This puzzle hunt will require significant effort and not a hunt that you can breeze through. Was the Draw Prize deadline extended? Yes, the previous deadline for completing the Prexcyt Quest was March 31, 2018. Due to issues that caused the postponement of the finale, the deadline for the Draw Prize has also been postponed a week to April 7, 2018. I have a question not on here! Please email us at cryptexhunt@gmail.com!